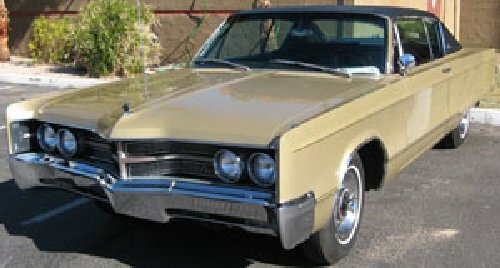 300 SERIES - (V-8) - The Chrysler 300 Series was further upgraded in comparison to the Newport Custom. Unique to the 300 was the rear end assembly. including deck lid, rear fender quarter panels and rear bumper. Tail lamps were located at the extreme end of the rear fender and sloped from deck level down to bumper height. The backup lamps were set into the bumper, below the tail lamps, in a similar form. The effect was pleasing and smooth. The front grille was in the style of previous 300 Series models, with the usual cross bar division within the grille cavity. Hubcaps with small spinners were an added touch. Standard equipment on 300 models included all features found on Newport Custom, plus bright interior garnish moldings; Torqueflite automatic transmission; bucket seats with center arm rest; lower door trim carpet panels; carpeted bucket seat backs; left hand ash tray; DeLuxe spinner wheel covers (as described above); 8.66 x 14 black sidewall tires and 440 cubic inch four-barrel V-8 power plant. VEHICLE IDENTIFICATION NUMBERS: The numbering system and code locations were the same as for previous models with the first two symbols changed to 'CM' to indicate Chrysler 300 Series. Additional coding followed the same system utilized on Newports. The letter 'K' as the fifth symbol indicated the attachment of the standard 350 horsepower 440 cubic inch V-8; the letter 'L' indicated attachment of the optional 375 horsepower 440 cubic inch V-8. CHRYSLER 300 SERIES ENGINEV-8. Overhead valves. Cast iron block. Displacement: 440.7 cubic inches. Bore and stroke: 4.326 x 3.75 inches. Compression ratio: 10.1:1. Brake horsepower: 350 at 4400 R.P.M. Five main bearings. Hydraulic valve lifters. Carburetor: Holley four-barrel Model R-3667A.